In reaction to the violence in Alexandria, Virginia, Vermonters of both political parties called for peace and greater civility. After Wednesday morning's baseball field shootings in Alexandria, Virginia, and a lengthy stretch of political division in the country, there are renewed calls for bridge-building. Among those issuing that plea is Sen. Bernie Sanders, I-Vermont, whom the suspected shooter apparently supported for president. 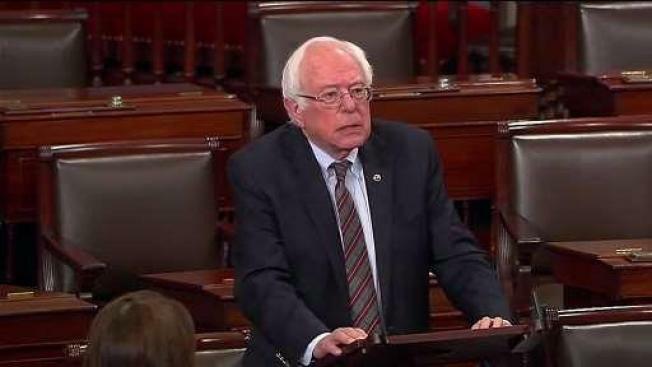 "I am sickened by this despicable act," Sen. Sanders said of the shootings on the floor of the U.S. Senate Wednesday after learning a former field volunteer for his presidential campaign is the suspected gunman. James Hodgkinson, 66, of Illinois, showed support for Sanders on his Facebook page, along with rhetoric critical of President Donald Trump. He died at a hospital after exchanging gunfire with U.S. Capitol Police and Alexandria officers, according to Capitol Police Chief Matthew Verderosa. NBC News reported police said it is too early to determine a motive. Many believe the shooter had targeted members of the GOP at a baseball practice. "I condemn this action in the strongest possible terms," Sen. Sanders said. "Real change can only come about through nonviolent action, and anything else runs against our most deeply-held American values." Sanders praised members of law enforcement for their swift actions, and wished the victims quick and full recoveries. That same spirit was echoed back at home by Vermont's Republican governor. "It's a sad day for the country," Gov. Phil Scott said. "It really is concerning when you see the amount of frustration – the anger – that's in our world and our country, and that it devolves into something like this—this violence. It has no place in our civilized society." Gov. Scott said he wished more people could come together across the country the way Vermont politicians have been known to, by generally showing civility and respect even when they have political disagreements. Wednesday was Flag Day, and at VFW Post 782 in Burlington, veterans were retiring faded and tattered flags in a respectful burning ceremony. Post commander Joe Gilmond said Old Glory needs to serve as a unifier, bringing together people from all political stripes. "We need to all be Americans and take care of each other," Gilmond told necn. "And hopefully, one day, again come together as one country." Rep. Peter Welch, D-Vermont, called Republican shooting victim Rep. Steve Scalise of Louisiana a close friend and respected colleague, despite their political differences. Scalise, the House Majority Whip, was among several people injured in the shootings, and underwent surgery Wednesday. The other people who were injured were: Matt Mika, director of government relations for Tysons Foods, who is in critical condition after being shot twice in the chest; Capitol Police Special Agent Crystal Griner, who was shot in the ankle; and Zack Barth, an aide to Rep. Roger Williams, R-Texas, who was shot in the calf. Rep. Roger Williams, R-Texas, suffered a sprained ankle. Capitol Police Special Agent David Bailey suffered a minor injury and was treated and released. "It's like everybody's stepped back, paused, and is reminded what ultimately is our opportunity here, and that's to make progress for the country," Rep. Welch said in reaction to the news of the shootings. "And we can't make it if we can't listen to each other." Welch said he will bring Scalise's office some Vermont maple syrup as one small token of his support. Emergency physicians said events like the Alexandria shootings are a reminder of how average citizens could be called on in a crisis to help others. Dr. Ajai Malhotra, the chief of acute care surgery at The University of Vermont Medical Center in Burlington, said he hopes people will lend a hand in a crisis, once it is safe to do so. Malhotra said the first step is to apply firm pressure directly to a wound, with gloved hands if they are available. If the bleeding is coming from a limb, Malhotra urged people to use a tourniquet. If a formal kit is not nearby, you could use a necktie or belt, applying it above the injury tightly enough that it stops the bleeding and you can no longer feel a pulse in the patient's arm or leg where the wound was suffered. "The leading cause of death after an event like this is uncontrolled bleeding, and uncontrolled bleeding, at least from the extremities, can be very well controlled, temporarily, with a tourniquet, until that person can be brought to a hospital," Malhotra told necn. The University of Vermont Medical Center said it plans to hold classes on tourniquet use in the future, hoping knowledge of tourniquets can spread as widely as knowledge of CPR has. For more information on what to do in a bleeding emergency, visit this website.